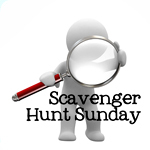 Scavenger Hunt Sunday: Hard to find | Life. Realized. This week's list of prompts were head scratchers. I really had to think outside the box on a few, while others sort of fell into my lap. Last week some of my photos felt uninspired, but I think I found my mojo again. After a week of weather confusion, we lost all of our snow. It looks more like a New England November than January...but colder. Last night we got the most beautiful dusting of glittery white snow. The landscape is hidden under this fine, iridescent coating and it is just lovely. Everything is sparkling under the morning sunshine. I was thrilled to see that I caught an individual snowflake in the above photo (can you find it? ), as it is hard to see an individual snowflake among the snow. I admit, this is a weird photo. I'll also admit that I am not exactly sure how it fits into the prompt. I got out of my car a couple days ago to see a scattering of tangerine slices on the pavement. I had my camera with me (of course), and had the urge to photograph them. People must have thought I was a nut. Something about the bright orange against the plain, scuffed up pavement caught my eye. Sometimes we garner inspiration from the oddest things, no? I have two photos for this one. Kiddo took a photo of the left side of my face in the car on Friday and I had to give him his moment in the spotlight. The other one was a self portrait, also taken in the car. These days I always have a camera in front of my face, so my left eye gets seen a lot more than my right. As I mentioned yesterday, I had a lot of fun shooting on the fog-filled ski hill on Wednesday. There are a few teenage snowboarders who fly down the hill, hitting all the jumps. It is pretty amazing to watch but hard to snap...they are fast. Jared came running in my room to show me his newest Lego minifig creations. He was also wearing my favorite shirt...a peace sign composed of animals. I decided long ago that this shirt is never getting donated...it is going in the bin that houses all of my favorite clothes he's outgrown. My goal is to someday make them into a quilt for his kiddos. This kid is never more at peace than when he is lost in a Lego creation. Love the snowboarding shot!! Gorgeous set all around! I love your hidden photo it is so crisp and clean looking. As for the tangereine, I probably would have taken the photo also and wondered what possessed someone to spend all the time to peal it and then not eat it. Wonderful interpretations. I love your interpretations. Especially the PEACE shirt... Haven't posted mine yet. Will do that instead of watching Super Bowl. I am enjoying your whole set. Love the hidden photo. I have a thing for close up shots. I once photographed a piece of broccoli sitting beside the road I was walking on. I don't judge!! I have also kept a drawer full of t-shirts from my now (almost) 20 year old daughter in hope of one day making a quilt. It will happen. Tell me this is a realistic dream and not a prelude into a guest spot on Hoarders. I see the snowflake - all six points. Beautiful shot. Thanks, Jen! I love how that photo turned out! I actually quite like the tangerine photo! So simple, with a splash of colour. The snowboard capture could almost qualify as hidden. While the tangerine may be unique for the "Plain" prompt, it does show imagination and the importance of always having a camera handy. Nicely done. I am actual blessed to read this article.thanks for giving us this advantageous information.I acknowledge this post.